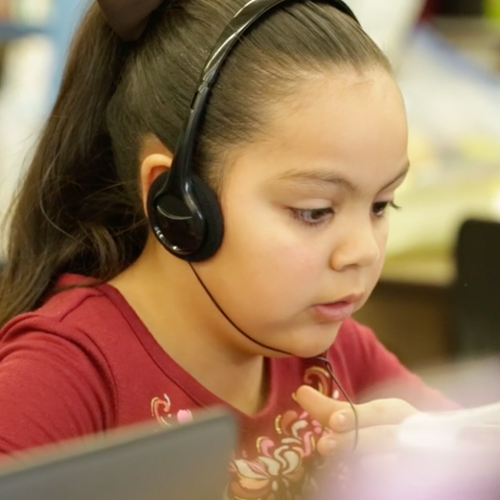 Blueprint is an online, supplemental software program for students in pre-K through second grade that teaches foundational skills and knowledge essential to future success in mathematics. 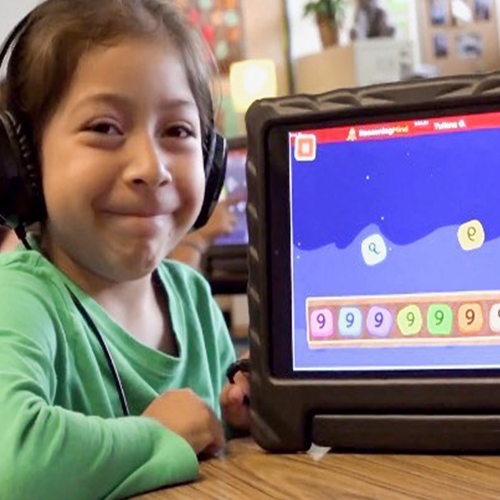 The program builds conceptual understanding through a combination of age-appropriate instructional exercises, educational animations, and detailed explanations. One component of Blueprint is an adaptive, diagnostic assessment that students take at the beginning and at the end of the year. The assessment measures a student's level of readiness in three domains: (a) Numbers, Counting, and Cardinality, (b) Addition and Subtraction, and (c) Geometry, Measurement, and Logic. Questions within each domain vary in difficulty from pre-K levels, to Kindergarten levels, to first-grade levels. During the 2017–2018 academic year, 10,039 students (pre-K through first grade) in fifty-six districts across five different states used Blueprint and completed both the beginning- and end-of-year assessments. Researchers examined these assessment results to see if there was a correlation between student usage of Blueprint and assessment growth. The recommended usage for Blueprint is to complete three lessons per week and collect all tokens which are earned by answering questions correctly throughout a lesson. The results indicate a positive relationship between the number of lessons completed and students' growth on specific mathematics domains. 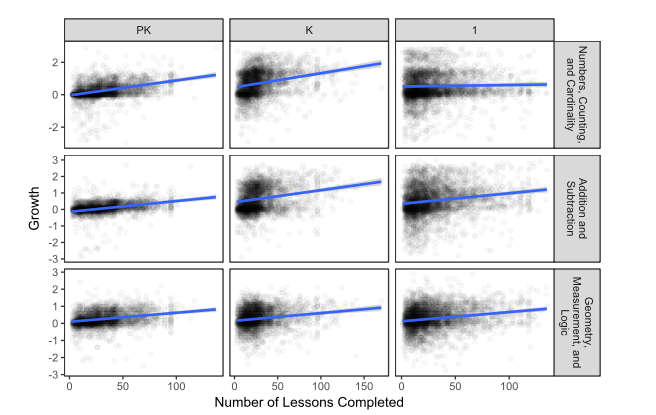 Figure 1 illustrates the correlation between growth and number of lessons completed for each grade and domain. Across grades and mathematic domains, correlations were positive for lessons completed and performance on the program assessment, meaning students who completed more lessons generally achieved more growth on the program assessment. Figure 1: Growth versus number of lessons completed for each assessment domain and each grade. The positive relationship between lessons completed and academic growth is also illustrated in Figure 2. 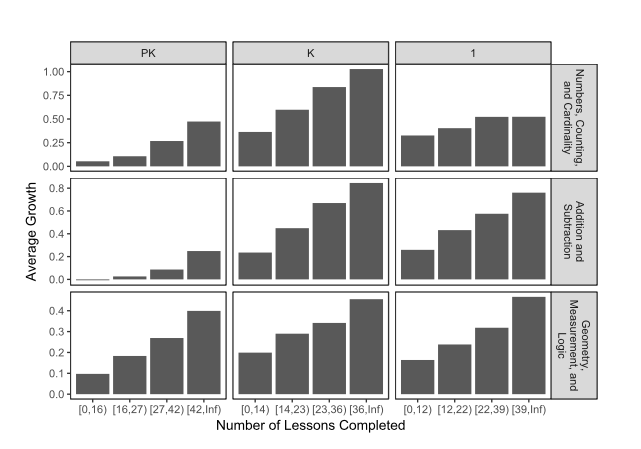 This figure presents the results in terms of number of lessons completed. Across grades measured, students who completed more lessons demonstrated more growth than students who completed fewer lessons. These results apply for all domains assessed. Figure 2: Average growth versus number of lessons completed for each assessment domain and each grade. The results demonstrate that growth on the Blueprint assessment is positively correlated with the number of lessons students complete. Students who completed more Blueprint lessons demonstrated higher growth than students who completed fewer lessons. This provides promising evidence that the program is effective for pre-K, Kindergarten, and first grade students. It should be noted that for this analysis, some groups of students did not meet recommended levels of usage. And yet, across the analysis, students demonstrated significant growth—nearly a full grade worth of growth for some students. We expect that students would demonstrate even greater growth with fidelity of usage.